On Tuesday, Pope Francis arrived in America for his much anticipated six-day visit, which includes traveling to three cities, holding several masses, speaking before Congress, and attending the World Meeting of Families. This is the pope's first visit to America, and though many assumed he came to visit the White House or deliver a speech to the United Nations, theses events were actually afterthoughts. The real intent of his visit was to go to Philadelphia and attend the World Meeting of Families. The event, which is held every three years, is an international conference celebrating prayer and the role of the religious family. The meeting opened on Tuesday and will run until Saturday, with the pope attending the closing festivities. During the meeting, nearly 180,000 Catholics from across the globe will gather together for prayer, lectures, and religious instruction. It's an event that is important to any sitting pontiff, as it was started in 1992 by St. Pope John Paul II. After it was announced that the event would be held in Philadelphia this year, Pope Francis promised to attend. Whether it's the draw of the pope or the attractiveness of Philadelphia is unsure, but this will be the largest attended World Meeting of Families ever. The meeting focuses on exploring the role of the family in society, and several of the lectures during the conference will address larger social issues. For example, José Horacio Gomez, the Archbishop of Los Angeles, will deliver a lecture of the effect of the U.S. immigration system on families. Other lectures will follow similar veins. If D.C. was feeling the pressure of several thousand extra Catholics during the pope's visit, it's nothing compared to Philadelphia. Pilgrims from more than 100 countries are packed into the city for the event, and organizers are expected to owe the city an estimated $12 million for the cost of the conference. But these numbers don't come close to the number of Catholics expected to come into the city this coming weekend. Pope Francis will attend the closing festival of the meeting on Saturday and will hold mass the following Sunday for the pilgrims and conference participants. More than 500,000 are expected to attend the two events, in hopes of seeing the pope. 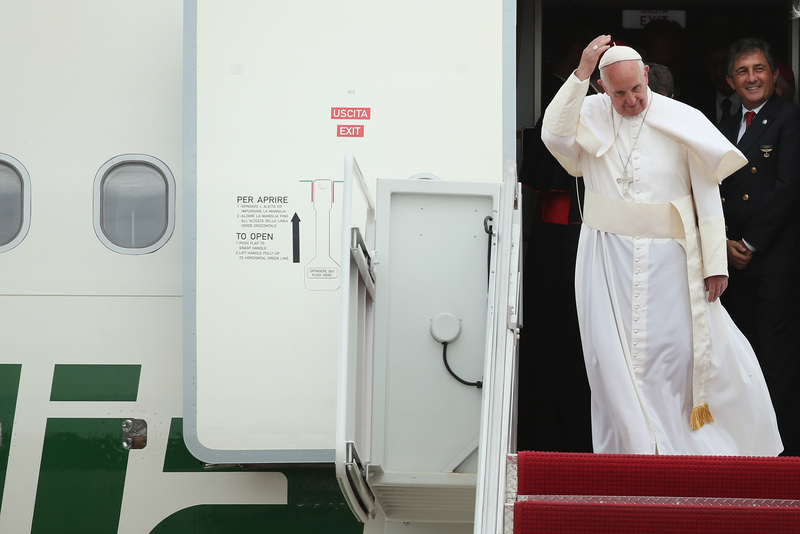 Following the mass in Philadelphia, the pontiff will end his first ever U.S. visit. Though the World Meeting of Families is not necessarily the most anticipated aspect of Pope Francis's visit, it certainly is the reason he's here. So those excited for his upcoming addresses to Congress or the U.N. should thank the conference for bringing the pontiff over — and for causing all the traffic in the D.C. area.